Juan Alvarado Nieves, who was in his 34th consecutive year as a professional wrestler in Mexico under a varity of ring names – most famously as “El Brazo” in one of the most noteworthy full-time trios teams in professional wrestling history - passed away very late Tuesday night, October 15, 2013, in a hospital in Mexico City. Alvarado had been hospitalized since the previous weekend after complaining of various gastrointestinal issues, and apparently had been in a diabetic coma for about 48 hours before his death. A diabetic coma is a nasty, horrible thing, and it was not a surprise that he suffered a myocardial infarction and stopped breathing late Tuesday night. Alvarado was one-third of one of the most famous wrestling trios ever, "Los Brazos." The second-eldest of six wrestling sons of Juan Alvarado Ibarra (who died in 2003) and Ana Nieves de Alvarado, Juan (born July 30, 1961) debuted in August 1980 in a trios match with his elder brother Jesus (“El Brazo de Oro” born 10-7-59, debut 10-5-75) and younger brother Jose (“El Brazo de Plata,” born 3-19-63, debut 1-21-77), the trio that would become world famous. 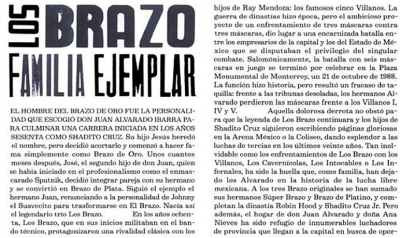 After Cruz retired, he was hired by Lutteroth as one of the trainers at the EMLL gym on the 4th floor of Arena Mexico. As they got older, Cruz brought his sons to work with him. Jesus wanted to know everything about how the business side worked. Juan just farted around, always getting into mischief. Jose was either angelic - funny or totally the miscreant like Juan, more often the latter, but always getting into fights. Juan, El Brazo, had to be kind of dragged along after a while and convinced to give lucha libre a try. He’d rather have been elsewhere. He always felt it wasn’t really what he had wanted to do with his life and was kind of a burden he had to bear. Trios’ wrestling was just catching on in 1980 with the rise of UWA and its Misioneros de la Muerte, Cadetes del Espacio, Fantasticos, Hermanos Mascaras, etc. Juan was finally convinced to start to train full time so as to eventually be a part of a family trio. Juan started out as “Johnny, El Suvaecito” in 1980, learned enough to join the family, as the trio despite some internal debate among Francisco Flores, Carlos Maynes, and Rene Guajardo about doing this. They felt that Jesus (Brazo de Oro) was a major superstar in waiting, one of the best workers in the whole business, very good in the locker room, a very reliable union rep, the total package in a promoter’s eyes. A few, including Porky (Brazo de Plata), had more charisma even back when he was basically in decent shape. A few, like the three Misioneros, were equal as workers. But Brazo de Oro had it all, and there was a faction that argued keeping Oro and Plata strong as singles and on occasion as a tag team (it was during this discussion window in 1979-80 that Oro & Plata won the Mexican national Tag Titles). But however it was made, the decision went the other way, and for the next 15 years, Juan, sometimes reluctantly, joined his brothers in winning every major trios title in Mexico (CMLL, UWA, National, FILL, WWA, and DF, and if there had been LA Trios titles like there was an LA Tag title, they’d likely have won that too). The October 21, 1988, triple-mask-versus-triple-mask match against Los Villanos I, IV, and V, at La Plaza Monumental in Monterrey. In a published interview about 10 years ago, Brazo de Oro revealed that their payoff for losing was 200,000 pesos total (about US $70,000 total at the time), which they got in installments that took years to pay off. There are many fascinating stories about all three of these matches, but not a one of them really involves Juan very much. By this time, he was a reliable lunch bucket guy, like say Buddy Roberts a third member of a famous trio, capable and reliable but not the one fans usually paid to see win or lose. There was a very well-done and highly-regarded skit done by Antonio Pena and the Televisa TV director in 1991, one that has become legendary over time. It showed the Brazos sleeping, each one dreaming of something – dreaming of what each man wanted to do in real life. Brazo de Oro wanted to be the big executive running things. El Brazo wanted to be a rock star. Porky wanted to be a professional wrestler. Each one hit the nail on the head legitimately (that was in truth what each man DID want to be when they grew up) and it also fit their professional images to a tee. Porky and Brazo de Oro got what they wanted (Brazo de Oro was Carlos Maynes’s right-hand man in the office after the death of Francisco Flores and Brazo de Oro has been the head of the CMLL chapter of the wrestlers’ union since roughly 1994). Juan did not. Eventually, this fact, compiled with all the other vagaries in the wrestling business, led to greater friction and discontent among the three brothers, particularly Juan and Jose. It came to a head around 1996 - Juan and his brother had a gigantic falling out. The falling out was so huge that the two never made up fully (they got along to get along) and in fact the night of Juan’s death, after he had gone in the diabetic coma and Porky knew this, Porky worked his regular schedule semifinal booking at La Arena Coliseo de Occidente in Guadalajara, doing what was basically a comedy match while his brother was in the final hour of life many miles and hours away in a Mexico City hospital. 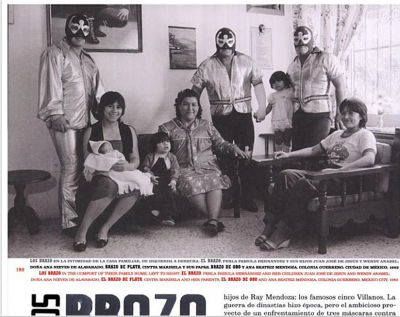 The family had been considered to model of wrestling families –so much so that in her picture book on lucha libre titled “Espectacular de lucha libre”, Lourdes Groubet took pictures of the three sons, their mom, wives, and children, referring to them as “Los Brazo: Familia Ejemplar”. How ironic that article and picture turned out to be. From the poster of good families in 1983 to the poster guys for a dysfunctional family in 1996-2013. In other bios and memories, from Kris Zellner to the Cubs Fan to the newsletter, the dates and facts are all listed correctly and a sense of a place in history is there. If there were a Hall-of-Fame sub-category for trios, this trio might well be the first from Mexico that would go in. For 15 years they were the bomb. Then their personal world exploded, Juan jumped ship to AAA, and seemed to most come alive when he was making fun of the sport (Latin Broiler, La Braza) that meant everything to his two brothers, the two brothers he both loved and hated more than anything until the day he died. 88/10/21 masks Villano I, Villano IV, Villano V Brazo de Oro, Brazo de Plata, El Brazo Plaza de Toros Monumental - Monterrey, N.L. This page was last edited on 21 August 2018, at 09:32.